Viet Ha is a highly respected Vietnamese lawyer, with special expertise in financial transactions, mergers and acquisitions, and general business, trade and investment-related issues. Before joining BGA as managing director for Vietnam, Ha managed the Vietnam operations of BrooksBowerAsia for three years. She built and led the Vietnam team and serviced clients in various sectors ranging from energy and IT to healthcare, logistics and consumer production. Ha practiced law in Vietnam in the 1990s, providing legal advice and consulting services to American Fortune 500 clients. She also participated in drafting a number of laws and regulations, including the Foreign Investment Law, the Commercial Law, and regulations on money laundering. She has authored a number of publications on foreign investment and the securities market in Vietnam. She is a member of the Hanoi Bar Association and the Inter-Pacific Bar Association and is an honorary member of the Center for International Legal Studies. Ha has also worked on a range of internationally-funded development projects, including a World Bank effort to improve financial transparency, public participation and grassroots accountability in the budgeting process; an Asia Foundation project on enhancing public participation in the legislative process; and a project on accelerating e-government co-funded by the Asia Foundation and the Ho Chi Minh City People’s Committee. Ha earned a master’s degree from George Washington University. 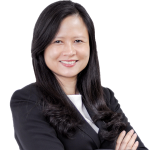 She also holds a master’s degree in international commercial law from the University of Nottingham (England), and a bachelor’s degrees in law and Foreign languages from prestigious Vietnamese universities.